The Fighting Irish had quite the linebacking corps from back in the day. During their prominent title runs of the late 1980s, the group had Frank Stams, Michael Stonebreaker, and Wes Pritchett manning the platoon. Called ‘The Three Amigos’, Pritchett was the black hole in the middle that soaked up targets and tackles. During his Senior campaign in 1988, he led the team in tackles with 112. Wes was selected by the Miami Dolphins in the 6th round of the prolific 1989 draft. He’d later suit up for 3 contests for the Atlanta Falcons in 1991. 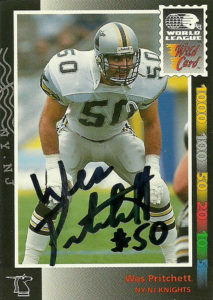 The New York- New Jersey Knights then selected Wes during the 1992 WLAF Supplemental Draft. He’d see action during the season recording a sack and an interception for 19 yards. As of 2017, Pritchett lives in the Atlanta area where he runs a very successful financial securities group.